Science isn’t just about blowing things up. Rather it’s about blowing things up and knowing how you did it. William Gurstelle is an American nonfiction author, magazine writer, and inventor. 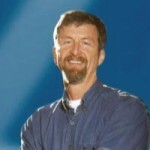 He is a feature columnist for Make Magazine and the Pyrotechnics and Ballistics Editor at Popular Mechanics Magazine. He is also the author of several science “how-to” books published by Crown Books/Random House and Chicago Review Press.